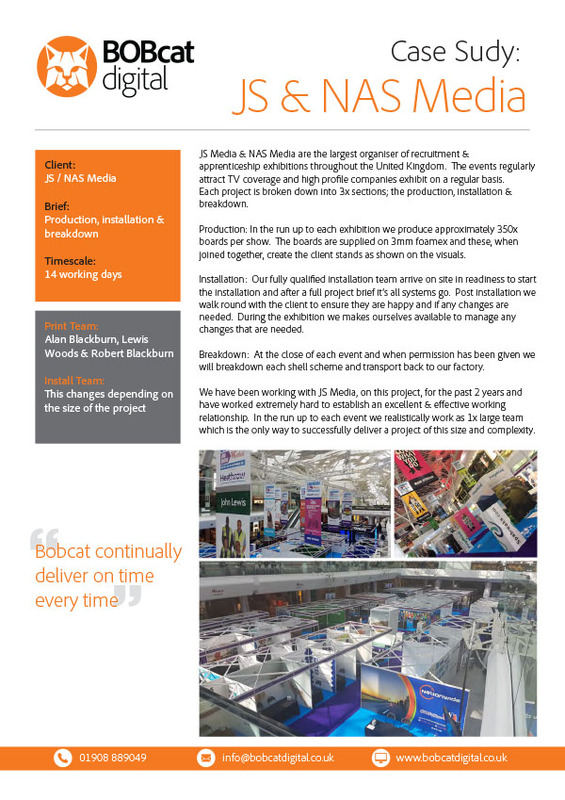 JS Media & NAS Media are the largest organiser of recruitment & apprenticeship exhibitions throughout the United Kingdom. The events regularly attract TV coverage and high profile companies exhibit on a regular basis. Each project is broken down into 3x sections; the production, installation & breakdown. We were approached by British Friendly as we had been recommended by another client. 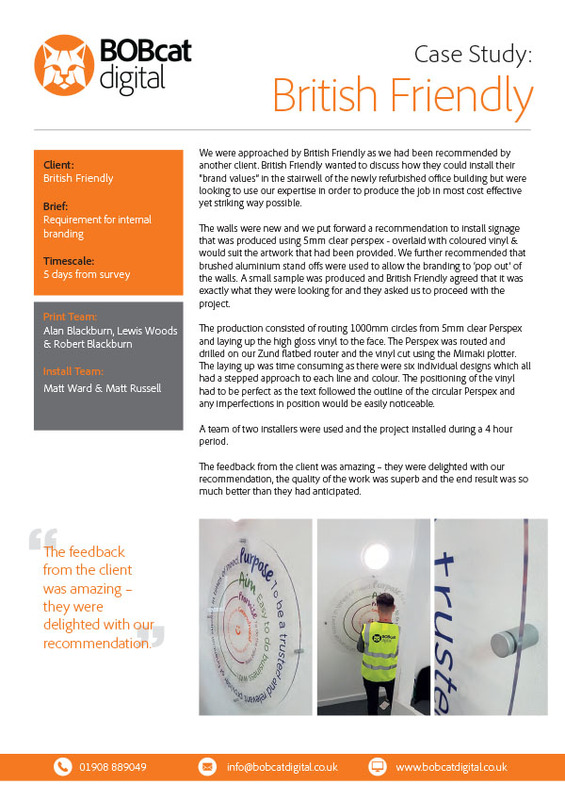 British Friendly wanted to discuss how they could instal l their “brand values” in the stairwell of the newly refurbished office building but were looking to use our expertise in order to produce the job in most cost effective yet striking way possible. 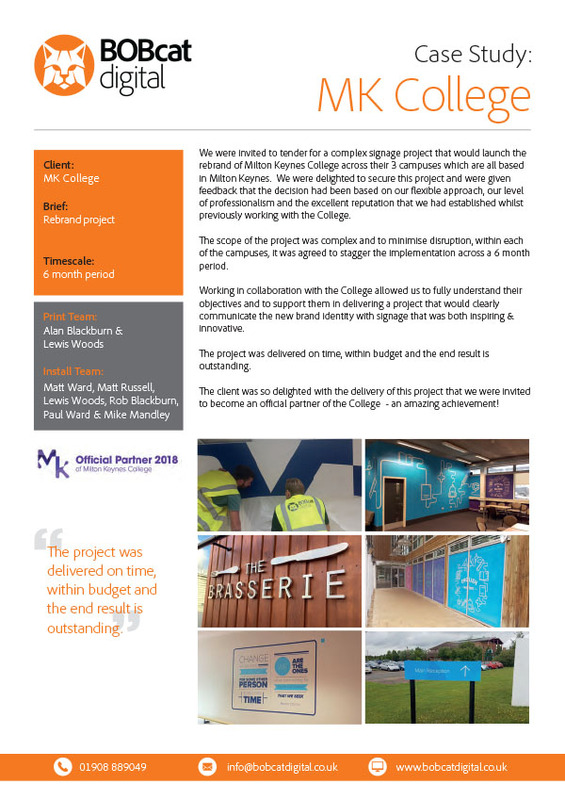 We were invited to tender for a complex signage project that would launch the rebrand of Milton Keynes College across their 3 campuses which are al l based in Milton Keynes. We were delighted to secure this project and were give n feedback that the decision had been based on our flexible approach , our level of professionalism and the excellent reputation that we had established whilst previously working with the College. 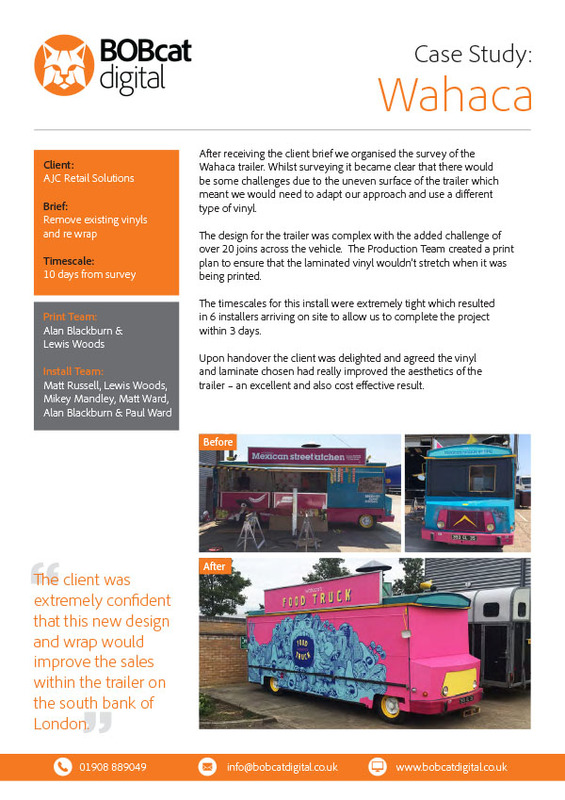 After receiving the client brief we organised the survey of the Wahaca trailer. Whilst surveying it became clear that there would be some challenges due to the uneven surface of the trailer which meant we would need to adapt our approach and use a different type of vinyl. We work with various clients that require large volumes of stickers from hire equipment through to trailer units. 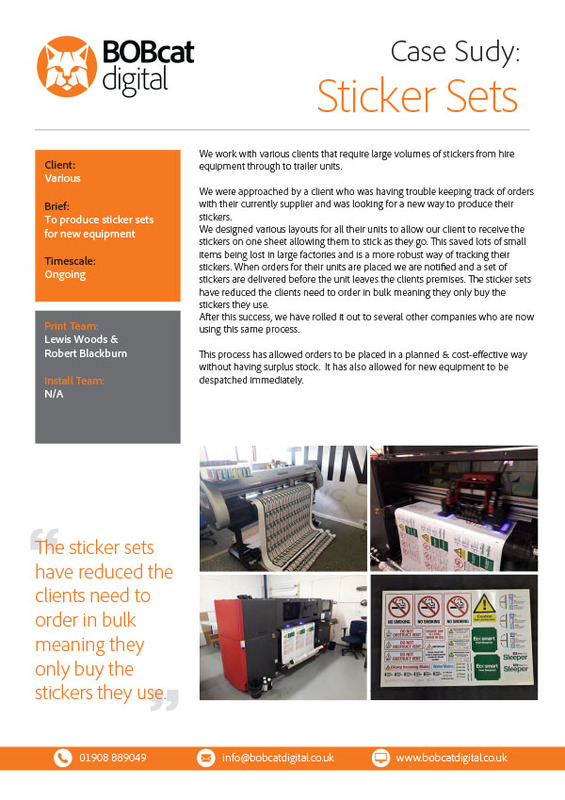 We were approached by a client who was having trouble keeping track of orders with their currently supplier and was looking for a new way to produce their stickers. 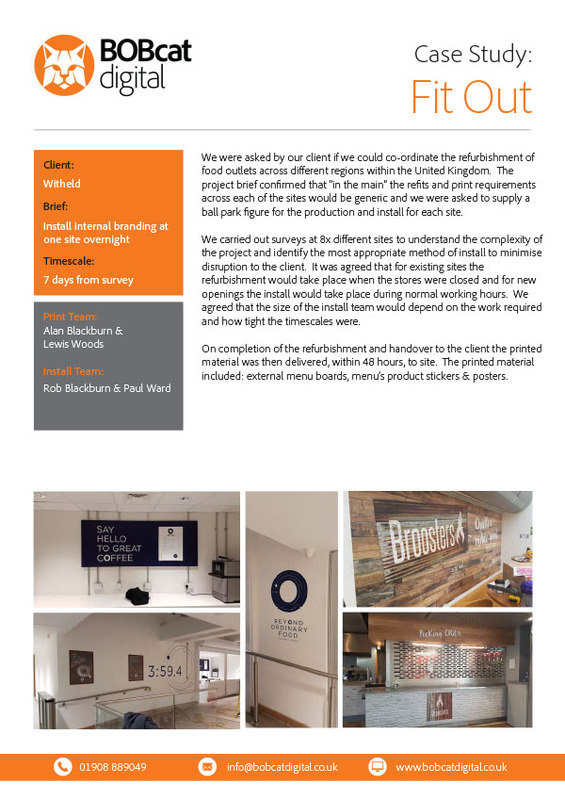 We were asked by our client if we could co-ordinate the refurbishment of food outlets across different regions within the United Kingdom . The project brief confirmed that “in the main” the refits and print requirements across each of the sites would be generic and we were asked t o supply a ball park figure for the production and install for each site.